Duvergé is the largest city in the Independencia Province of the Dominican Republic. The first settlers of this community were the gentlemen Christopher Pérez and María del Pulgar, originating from San Juan de la Maguana, who they were established in Bermesí. They were Spanish shepherds that with some kin and African slaves founded the populated of The Ladies in the year 1772. Some historiographers affirm that the name of "Las Damas" arose due to that the men that fought in these lands, by the country they kept their women to the edge of the river and when they finished their military combats they exclaimed: We go for our Ladies! Thus the name of Las Damas arose. The village of The Ladies became a part of the common one of Neyba Province of Azua of Compostela, Department of Ozama on May 9th, 1850 by the law not. 533 on territorial division. But by late May 17th, 1876 by the number of inhabitants and by its agricultural importance, the president Ulysses Francisco Espaillat signed the decree not. 1524 erecting in Cantonal Position upon populating of The Ladies belonging to the common one of Neyba, Province of Azua. 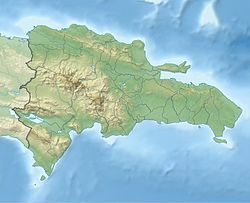 On September 12th, 1881 became a part of the Maritime District of Barahona, jointly with Petit Trou, which today is the Municipality of Enriquillo. During of the government of Ulises Heureaux (Lilís) the vice president of the Republic Wenceslao Figuereo instituted in common with the name of Duvergé the Cantonal Positions the Ladies of the Maritime District of Barahona, June 22, 1891 offering him the name of Duvergé in honor of the hero of our war of General independence Antonio Duvergé. The common one of Duvergé was segregated of the Province of Barahona, in its condition of common to become a part of the Province Bahoruco by means of the law not. 229 of March 18, 1943. In the year 1949, in the government of Rafael Trujillo was promulgated the law not. 2107 by means of which the common one of Duvergé becomes a part of the Province Independence to the present time. The municipality of Duvergé, is a plain entrenched between saws and mountains. This is located geographically in the Valley of Neyba but politically belongs to the Province Independence. This community this to some 17 km. of Neyba and to 42 km. Of Jimaní, municipality head of the province. Duvergé is located in a zone of abundant cactus, with an irregular climate. Nevertheless, it counts on currents of groundwater and superficial sources that dampen the lands and in spite of the aridez they are eligible for production. Duvergé is one of the municipalities of the Dominican Republic that possesses a plain without equal. In its lower part is very plain with light slopes. The urban part has an extension from 6 to 8 km. 2 approximately. Their high parts are formed by bluffs and steep mountains, that form part of the Saw of Bahoruco, which extends from Barahona to the neighboring Republic of Haiti being found in her large heights as are the Hill of the Bull, with 2.375 meters. The Avocado with 2.267 meters, this has large extensions of peak and was declared a national park to avoid the deforestation and the extinction of some species of endemic animals and natives for the purpose of conserving the flora and the fauna. You get dark them in this community they are gaudy, contrasting with the color of their mountains. Their natural landscapes are very pleasant serving of source of inspiration to our compueblanos and visiting. The municipality of Duvergé has a territorial extension of 501,43 km2. This population has followed an evolutionary process of growth and development marked for phases, with dynamic influences in the emigration and immigration. This area has a population of 17.320 inhabitants, of which 12.053 live in the urban zone and in the rural zone 5.267 inhabitants exist. Duverge has a hot semi-arid climate (Köppen climate classification: BSh). The main source of income of Duvergé, is the agriculture, being this the most developed one of the province Independence. The great majority of the agricultural lands they are dedicated to the production of banana, Guinean, yucca, yam, coconut, vegetables. As the municipality of Duvergé abuts with the Lake Enriquillo, Is frequent the exploitation fishing ground, being marketed the tilapia in large quantities, which is used for the local consumption and of the adjoining municipalities. The local commerce acquires certain dynamics, in consequence of the informal sales of edible products and clothes that come from Haiti. The municipality receives monthly incomes by a total of RD$ 1,681.035,52 (A Million six hundred eighty-one Thousand Thirty and Five Pesos with fifty-two Cents), approximately, of funds of the central government. This page was last edited on 21 March 2019, at 09:44 (UTC).